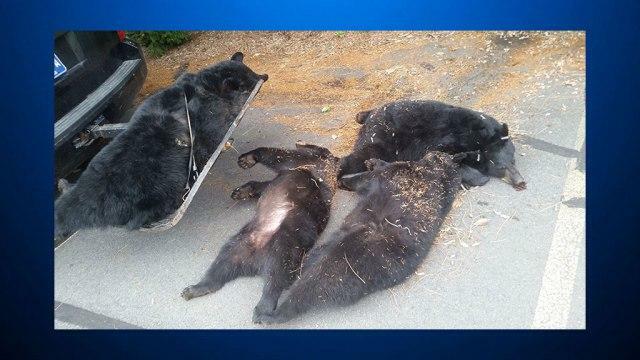 WEST WYOMING, Pa. -- Game commission officials say a poisonous ornamental shrub likely killed a black bear and her three cubs found dead on a church parking lot in northeastern Pennsylvania. The bears were found on the lot of St. Monica’s church in West Wyoming, Pennsylvania, on Dec. 6. The Pennsylvania Game Commission says the bears ate the leaves and seeds of an English yew plant before they died. The plant is highly toxic to people and most animals if ingested. Yew arils are sweet tasting and might have attracted the bears, the commission said. “This is the first case of black bear deaths attributable to yew intoxication that I have heard of,” said Game Commission wildlife veterinarian Justin Brown. Officials say the 300-pound sow and her cubs were known to frequent populated areas, where yew typically grow, and the bears were likely foraging for food. They say the bears likely died suddenly.